For those of you who follow me on Twitter, you know that I have been without air conditioning in my area of the church until recently. This caused me to seek other places to work, which resulted in a messy office. Well, the air is finally fixed, and I am beginning to get my office back in order. While I was putting everything back together, I got an idea. Our student pastor just got a new computer, so all of his peripherals were in the closet in another office. I grabbed the monitor and hooked it up to my laptop. The two monitor setup has helped immensely. I generally keep Hootsuite (I maintain the church’s Facebook and Twitter feeds) up on the monitor while I work on the laptop screen. 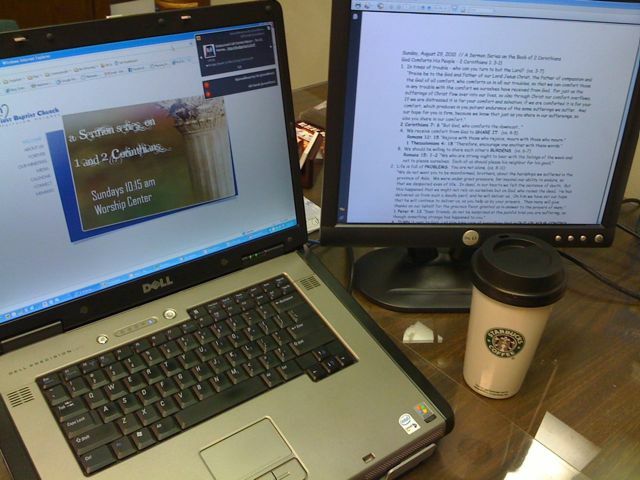 Or, as seen in the picture, I have the pastor’s sermon outline on the monitor while adding it to YouVersion on the laptop. I’ve heard pros and cons to this approach. The “against” view comes takes the position that two monitors do not make one more productive, but moves one to a more disorganized workflow. However, I have found that, rather than pull up other information manually, I save time by having that info up on a separate screen where I can glance at it. Nothing spectacularly sophisticated as far as the tech goes, but my approach to my work is much more organized. And, the ever-present coffee helps, too.